I’M BACK! I knew it had been a long time since I had blogged, but it wasn’t until I started getting comments and e-mails in the past couple weeks asking me when I was going to post a new entry, that I realized just how long it had been! We are just finishing up our ‘show season’ here in the office. I think I mentioned in a previous post that every year from January through March we attend travel & sportsman’s shows across the country to promote our area. (San Juan County, Utah) There are 3 of us here in the office, and we were all very happy with the shows we attended this year. LOTS of interest in Utah out there! I can’t tell you how many times people came up to my booth and told me that they were planning a trip to Utah this summer, or that they had just taken a trip to Utah within the last year. And I always love the people who come up and say that they came to our booth last year and visited our area over the summer, and then proceed to pull out their cell phone and show you pictures from their trip! But as much as we love attending shows and helping people plan their trips, I think we’re all breathing a sigh of relief that we made it through another year and that we’re back in the office and able to catch up on everything! So on to the blog entry! 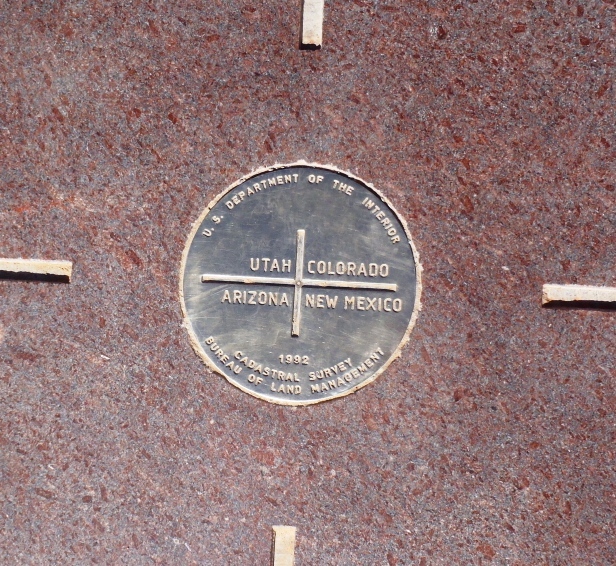 The Four Corners Monument is the only place in the Unites States where four states (Utah, Colorado, New Mexico, and Arizona) meet at one point. The original marker was placed there in 1912 and since then a cement pad and vendor stalls have been constructed and the monument has been completely rebuilt twice. 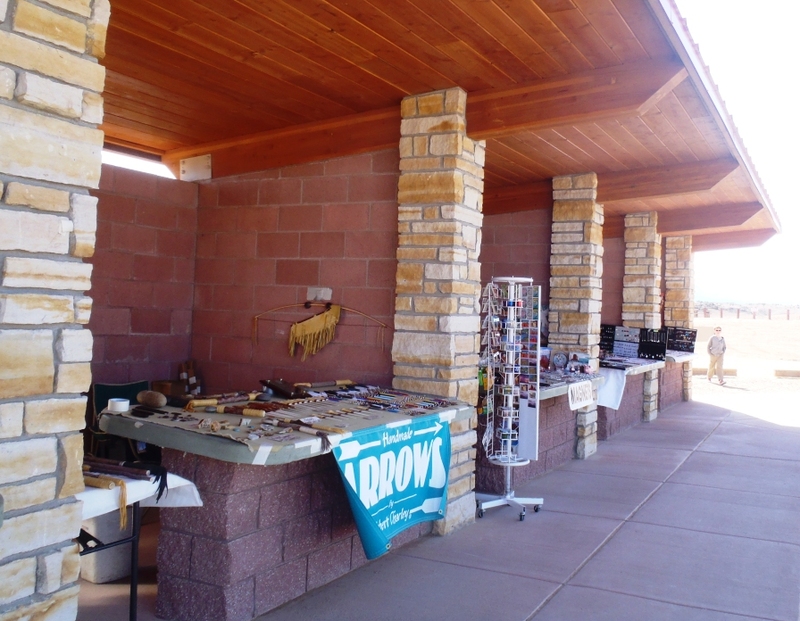 The most recent construction to the monument was in 2010 when the monument was closed for a couple months for the cement pad to be replaced and for the new vendor stalls to be built. Since I hadn’t been there since then, I really couldn’t tell people from first-hand experience what the monument was actually like now. 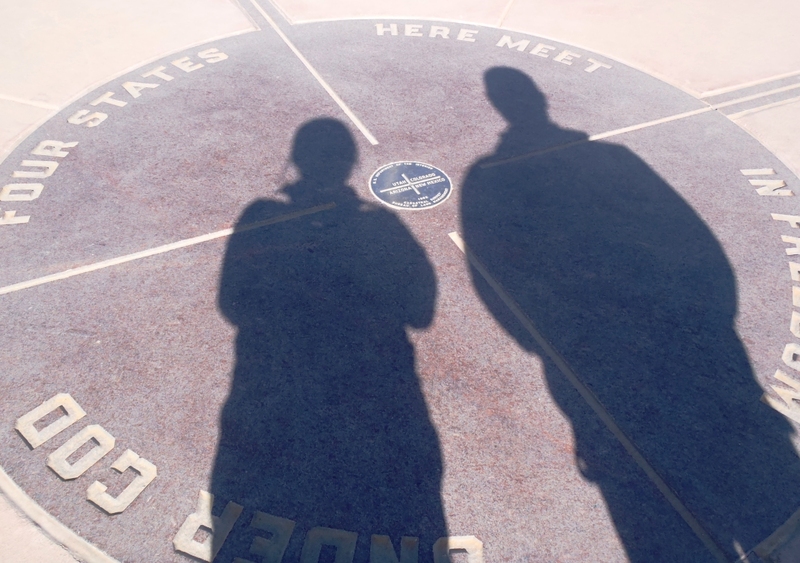 We get quite a few questions about the Four Corners Monument on our toll free number here at the office, so I really felt like I needed to go there and see it for myself. We decided to take Hwy 262 to the Four Corners- this road heads east off of 191 just about 15 miles south of Blanding– this route is just under 100 miles and takes about 2 hours from Monticello. This is also one of the ways you can get to Hovenweep National Monument. The road we took to the Four Corners took us from Utah to Colorado, and then into New Mexico which is where the actual road leading into the Four Corners Monument is located. 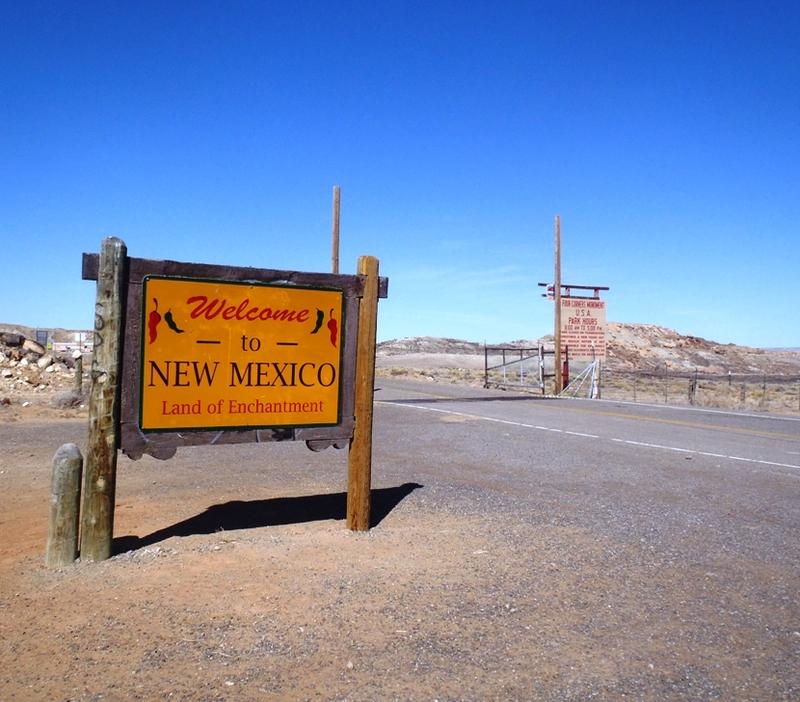 When we arrived at the turn I was surprised to see that we were in New Mexico. I guess the fact that I’m always telling people on the phone that the nearest town is Teec Nos Pos, AZ, made me assume that the entrance was in Arizona. Good to know! That’s exactly why I like to go and see things for myself! By the time we arrived at the Four Corners we were ready to eat! We had packed our own lunch and taken it with us that day, so we headed straight for the picnic area that’s off to the right just after you pass through the entrance station. Even though we were there during the off season, the whole time we were eating there was a steady stream of cars and RVs coming and going. After we finished our lunch we walked over to the monument to take some pictures and visit the vendor stalls. There were only about 10 vendors there that day, but I talked a little with one of them who told me that during peak season (May 1st- September 30th) every stall is filled every day. 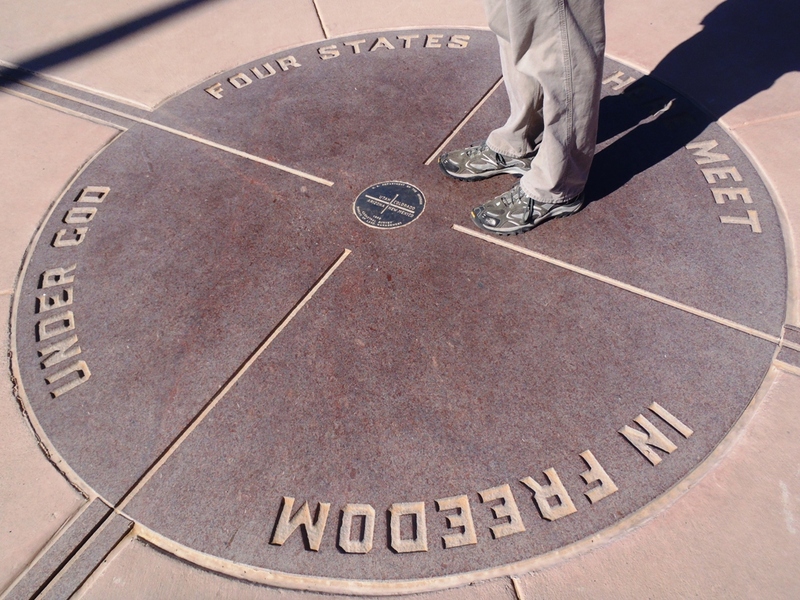 One of my favorite things about visiting the Four Corners Monument is watching how people pose to have their pictures taken while standing on the marker. I’ve seen people do handstands, upside-down bridges, lay with one appendage in each state, and even families who formed pyramids over the marker! 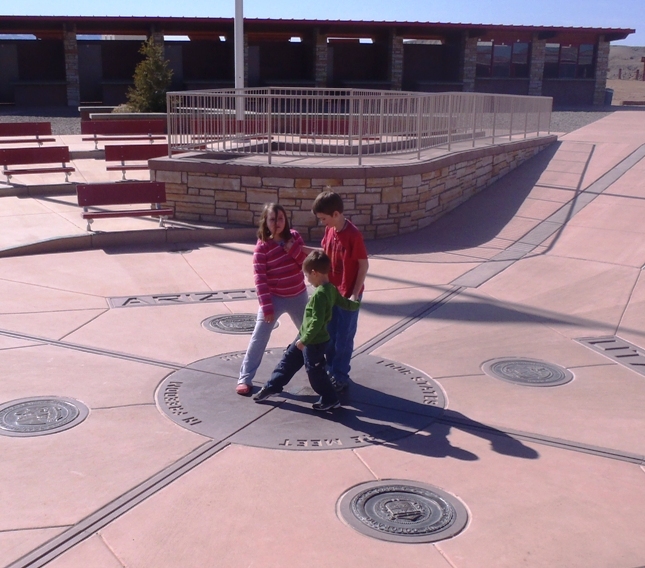 Just during the time that we were waiting to take pictures, you could really see that kids LOVE the Four Corners! We saw one kid running in circles saying, ‘I’m in Utah, now I’m in Colorado, now New Mexico, now Arizona, now I’m back in Utah…’. We also saw several fights, some that ended in tears, between siblings who couldn’t agree on who got to stand in which state for the picture. It was very entertaining, to say the least! I could totally see my sisters and I fighting like that if we had gone there when we were kids! Even though it was the off-season, it was still busy enough that we had to wait our turn to stand on the marker and take pictures. I tried to get my husband to do and upside-down bridge or a hand-stand over the marker, but he didn’t want any part of it! We ended up just taking a picture of our shadows over the marker. Looking back, I guess I should have been satisfied that he even came with me in the first place! 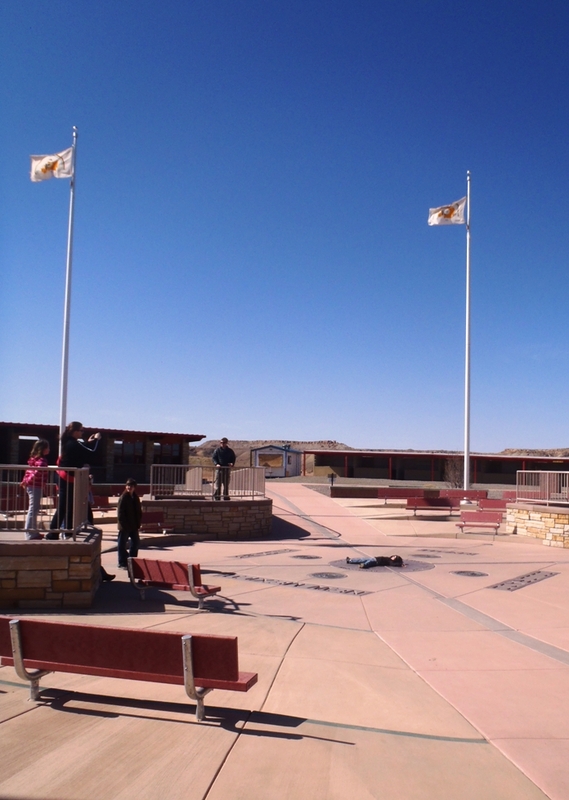 We are often asked on our toll free number if the Annual Pass will cover entrance into the Four Corners Monument. The Annual Pass is for National parks and monuments, and Four Corners is a Navajo Tribal Park run by Navajo Parks and Recreations, so Annual Passe ARE NOT accepted. Entrance fees are $3.00/person and children age 6 and under are free. 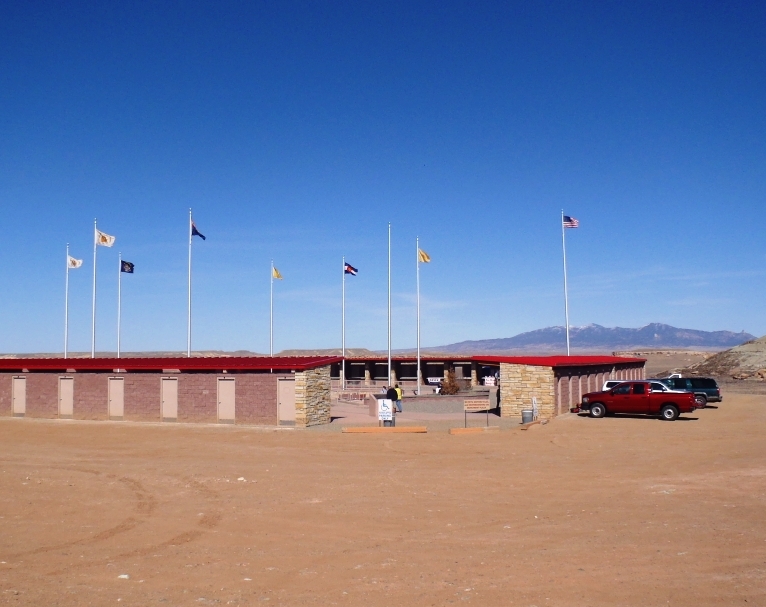 For driving directions to Four Corners Monument, please visit the Navajo Parks & Rec Website. 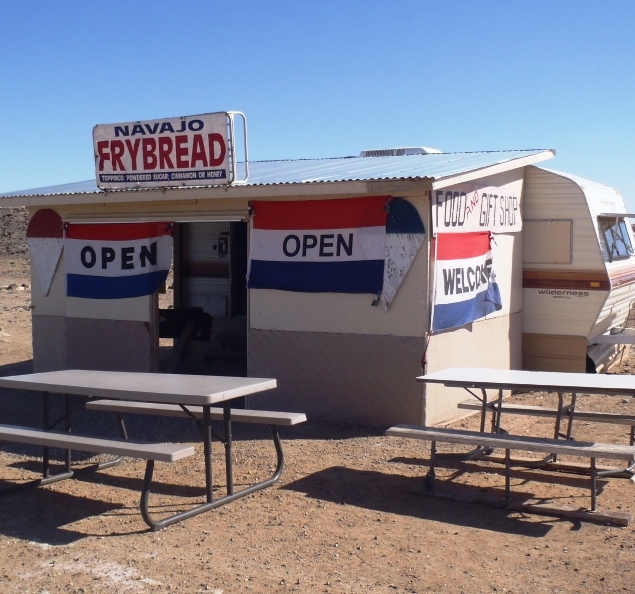 This entry was posted in Four Corners Monument, Navajo Tribal Parks, Off the Beaten Path, Travel, Utah and tagged Four Corners Monument, Navajo Tribal Parks, Off the Beaten Path, Things to do with kids, Travel, Utah. Bookmark the permalink. Sandy- Thanks for your comment! YES- the Lone Ranger remake has been big news around here lately! They had an open casting call for extras in Moab a couple weeks ago and I know quite a few people who went and submitted photos hoping to become extras. I think they said they’ll be filming in this area in July & August, so it should be pretty exciting around here this summer!